This loaf is ideal for picnics or a packed lunch. It’s delicious eaten plain or buttered. I suggest Red Leicester in the mixture because of its colour but a mature Cheddar can be used instead. It keeps well for 2 – 3 days. 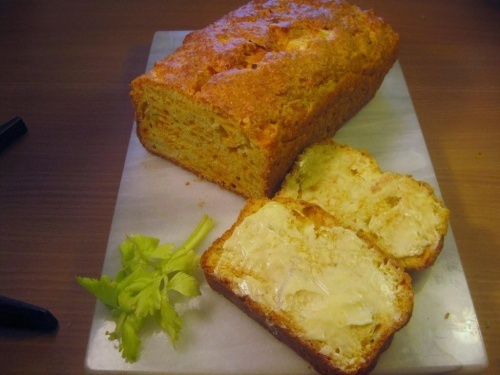 You will need a 1lb loaf tin measuring approximately 10 x 23 cm (4 x 9in) across the top. Grease the loaf tin, line it with greaseproof paper and grease that. Coarsely grate the cheese, trim and chop the celery, slice the spring onions. Into a mixing bowl sieve the flour, salt, mustard and baking powder. Rub in the butter, stir in the cheese, celery and onions, and then mix with the beaten eggs and milk. Put into the tin and smooth the top and bake for approximately 50 minutes or until golden brown and firm in the centre. Allow it to cool slightly in the tin then turn it out onto a cooling rack. Serve plain or buttered. Store in an airtight container. It freezes well and is perfect when defrosted.